Shaima Stalk and Ramzi Ramadan are the best of friends and neighbours in Cinnamon Grove. One day, Shaima comes up with the bright idea of searching online for a prospective husband for her aunt Urooj, a renowned entomologist who is single and lonely. The candidate whom she chooses, Rasheed Khan, oozes charm and affability that soon enchant Urooj and the family. Yet when Shaima catches him cheating in a game of monopoly, she discovers he’s not what he seems and deeply regrets her action. 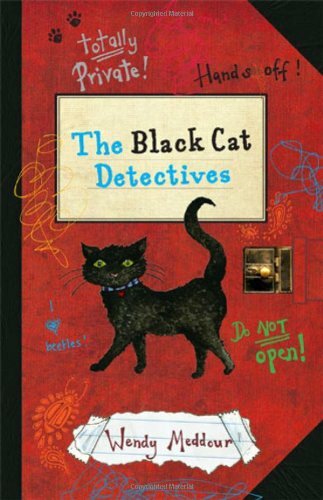 It is then that she and Ramzi establish their very own Black Cat Detective Agency - with the sole purpose of investigating Rasheed Khan’s life further. The story weaves adventure with details of the everyday lives of two Muslim families, one Pakistani, the other Algerian. Intrigue follows intrigue as Shaima and Ramzi hone their detective skills and work around family routines and celebrations. This book is most welcome, not only for its Muslim characters of whom there are far too few in contemporary children’s books set in Britain, but also for the way it promotes values in which learning and academic achievement are highly prized. Most importantly, it is also an entertaining read.